A couple of years ago I decided to wage war on aging, as many of my readers already know. I was looking in the mirror and wasn't so happy with what I saw. My skin was looking dull, and beginning to sag a little, especially at my jawline. I have a few fine lines around my eyes, you know, those little crow's feet. UGH! So, I have made it my personal quest to find products that really work. I guess I'm in the front line on the battlefield of the anti-aging war, so to speak. There are a few requirements for the products that I let my readers know about. First, the product has to live up to their claims. Secondly, I like to find products that aren't full of harmful chemicals. I feel like all those chemicals do more harm than good. Thirdly, I like to find products that are a good value for your money. 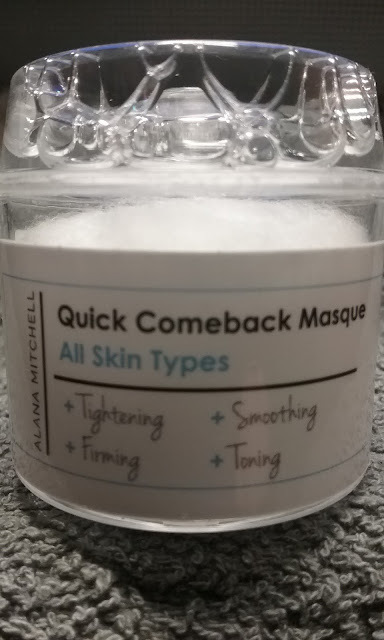 Quick Comeback Masque by Alana Mitchell fits all of my criteria. When I first received my package, I opened it and thought "Oh my goodness...what is this little bitty container going to do?" Let me tell you, it does all it claims that it will. It's very easy to use. Just press the button on the top of the container, that will allow the liquid in the top to seep into the bottom of the container and soak the cotton pillow that's in the bottom part of the tub. Let it sit until it turns into gel. The combination of ingredients is what makes the masque. Apply it to your face and let it stay for 15 minutes, then rinse with warm water. It's that simple. Your skin instantly feels tighter, more toned and smooth. It will have a bright , healthy glow. This looks awesome. I need to try it! This looks like something my sister would love!